[AUTO](VC/RC):When it attacks a vanguard, COST [Counter Blast (1)], put the top card of your deck into your drop zone, and perform one of the effects below depending on that card’s type. • Normal unit – Draw a card. 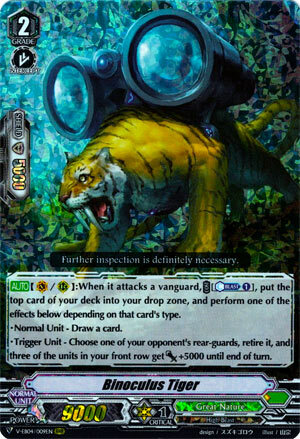 • Trigger unit – Choose one of your opponent’s rear-guards, retire it, and three of the units in your front row get [Power]+5000 until end of turn. Everybody loves some sort of +1 to them, right? As far as money’s worth for CB1 goes, this is actually not bad. A free draw in the worst case, a kill scored on an opposing card plus columns if it’s a trigger. That’s not bad. It also helps that the main ride Leo-pald consumes no CB himself so most of the advantage is going into this plus Tank Mouse if you can spare him. A staple 4-of. No if and/or buts.